Name two more talented left handers, two players with supple wrists and outstanding feeling for a table tennis ball; you will struggle to find better than Japan’s Koki Niwa and China’s Lin Gaoyuan. At the quarter-final stage of the Men’s Singles event at the Seamaster 2017 ITTF World Tour Platinum, Hybiome Austrian Open in Linz on the late afternoon of Saturday 23rd September; the two gifted young men met. The decision went in favour of Lin Gaoyuan. Imposing his will on proceedings at the earliest opportunity, Lin Gaoyuan, who had been required to compete in the qualification tournament, emerged successful in five games (11-5, 11-5, 13-11, 10-12, 11-4) against the player who occupied the second seeded position in the competition. Notably it was the seventh meeting in international competition between Lin Gaoyuan and Koki Niwa; the verdict now reads one in favour of Lin Gaoyuan. 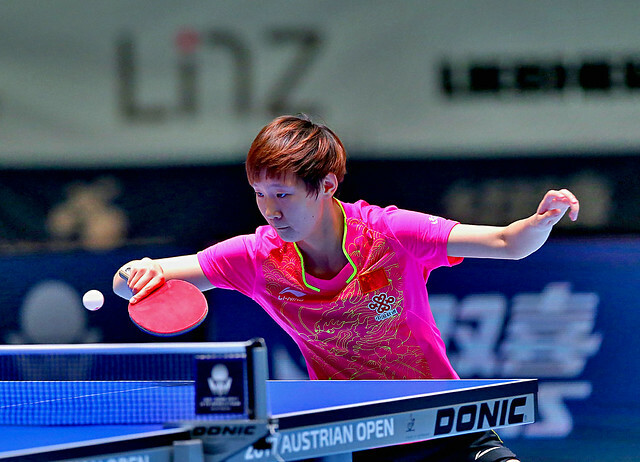 Lin Gaoyuan beat Koki Niwa at the Volkswagen 2009 World Junior Championships in Cartagena de Indias and in the Under 21 Men’s Singles event at the KAL Cup 2010 ITTF World Tour Grand Finals in Seoul en route to seizing the title. Conversely, Koki Niwa prevailed at the 2010 Asian Junior and Cadet Championships and the following year on the ITTF World Tour on home soil in Japan. However, it was at the Volkswagen 2010 World Junior Championships in Bahrain where the most significant results were recorded; Lin Gaoyuan beat Koki Niwa in the Boys’ Team event but in the contest that closed proceedings, the Boys’ Singles final, he experienced defeat. Now seven years after a match in which he was faulted several times on his service, he avenged the loss. Revenge for Lin Gaoyuan, it was somewhat the same for Frenchman Simon Gauzy; the no.4 seed, he accounted for Brazil’s Hugo Calderano, the no.15 seed, in four straight games (11-8, 13-11, 11-6, 11-9). Like Lin Gaoyuan, Simon Gauzy now holds a one match advantage. Also, he reversed the decision of their most recent international engagement when opposing Hugo Calderano. Simon Gauzy beat Hugo Calderano at the Volkswagen 2012 World Junior Championships but then on the GAC Group 2013 ITTF World Tour experienced defeat in the Under 21 Men’s Singles event in the Czech Republic. At the semi-final stage Simon Gauzy meets Lin Gaoyuan; the semi-final contests will be played later in the day.